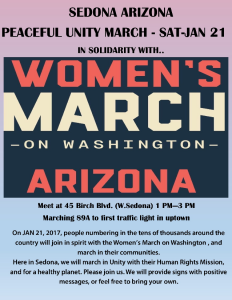 Sedona AZ (January 8, 2017) – A diverse group of local residents has organized a “Peaceful Unity March” to take place in Sedona, in support of the Women’s March on Washington, January 21. 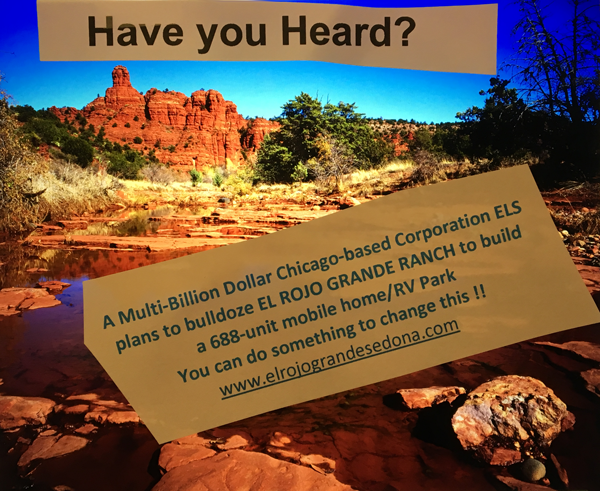 Sedona’s marchers will step off at 1:00 in the afternoon from west Sedona and walk to Uptown along SR 89A. The Sedona march is one of several planned throughout Arizona and the country, the day following the presidential inauguration. The marches aim to bring together people of all genders, ethnicities, and personal expressions in a showing of solidarity for social justice, healthcare protection, environmental protection, protection of undocumented families, and respect for religious diversity. The unity march is open to everyone and will begin at Creative Gateways, 45 Birch Boulevard (across from Whole Foods) in west Sedona. Signs will be available, but people are encouraged to bring their own, expressing positive messages of unity and equality. Cool, good to see this, thanks for the article/notice! Just a regular Sedona day!!!!!!!!!!!! No one will hear your message because the vast majority of Americans are fed-up with your message. That majority recognizes your message is that of (deleted by editor) Hillary snowflakes aka communists, Luciferians, Globalists and Satanists. Have fun accomplishing absolutely nothing, as usual. You post sounds a lot like your talking about the complainers here on SE… you know who you are ESM JRN JJ and the rest..
About how many folks showed up for the march? Do you realize that you’ve just admitted that YOU’RE ALL FOUR OF THESE HANDLES while accusing me of being two handles with no evidence or confirmation of any kind? Can’t you ever do anything right? @West sedona resident All this hate, anger, whining and finger pointing is really super unhealthy for you. It is really not pretty and I am concerned for you. There are many that go to Hot yoga of all ages both male and female. Please come try it. You will feel much better. Let it go. Move on in life. Make it better for you. You shouldn’t be concerned of others but of your own behavior. Please join us at Hot Yoga. Be happy!! 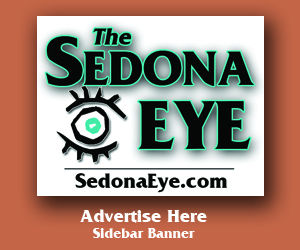 A blind man can see that….Your bloviating is excesses and distinctive..
1,500 people marched, carried signs, and chanted at Sedonas Peaceful Unity March, according to estimates from local organizers and the Sedona Police Department. The march was one of several hundred marches and rallies that took place last Saturday, throughout the country and in other cities all over the world, in solidarity with the Womens March on Washington. Various media outlets have estimated that there were over one million participants, worldwide. The Sedona crowd gathered at Birch Blvd. in West Sedona and marched to Forest Road, in Uptown, accompanied by the horn honking of passing vehicles expressing support for the marchers, who stayed on public sidewalks for the event. Sedona Police provided traffic control and reported that they received no complaints. Speakers at a brief rally held just before marchers stepped off included Rabbi Alicia Magal of the Jewish Community of Sedona and the Verde Valley, Sedona Mayor Sandy Moriarty, and Barbara Litrell, President of the local chapter of the League of Women Voters. Each welcomed the crowd and spoke about the importance of speaking out and of working together. The crowd was made up of numerous, diverse community groups and individuals, including members from the religious community, political organizations, and environmental organizations. I call on Sedona women not to march under the banner of the women’s march this year. Disassociate yourselves with those racists & misogynist pigs of men like Louis Farrakhan and the women in charge of this march that support them like the copresident of this marching organization. I won’t support any one associated with this anti white, anti men, anti religion, anti Christian, anti Jew, anti Hispanic, anti Latino, anti America, anti freedom. My family fought for civil rights in the 60s and to be associated with Farrakhan and Ben Jealous NAACP puts us back decades. Evolve. Evolve forward. Evolve Evolve Evolve. Women who can’t call a racist black man out can’t lead other women of color. Women who can’t call a racist out can’t lead women. Period. Women who want to subjugate themselves to men don’t lead women. These women who feel the need to grandstand to defend their so-called rights are an embarrassment. If a woman doesn’t have the stamina to smack some guy in the snoot if he makes improper advances in public then maybe she needs better women teachers. If she’s so offended by male attention then why wear plunging necklines and tight fitting clothes that send quite the opposite message these prigs are now marching against. The same phony women who defend “politically correct” crap and no longer say Merry Christmas or thank you if a door is opened for them? Maybe they’ll get a whole lot worse than some man misreading their obvious attempt to allure them but then cry poor me? If your such a strong vibrant women, why do you hide behind an anonymous name..? Be strong be tough…reveal yourself. Your post seems like that of a frail scared women who hides behind her rethoric.. Join on the March you may “come out” from behind that wall you’ve been hiding behind. Did some research and the initial comment is correct. The progressive leader of this march was on the View. No one challenged her like the racist she is and no media coverage of her racist views. She supports Louis Farrakhan totally. She refuses to repudiate his anti-Semitic statements and beliefs including his anti-white devil beliefs. Appreciate rabbi Magal, but this isn’t a cause to align with because of its anti Semitic leadership; time for Sedona women to take a human rights stand and sit this one out or create a separate march that reflects our values. Or do Sedona women accept the anti Semitic stands of this march’s leadership? Make a tough choice and do right. Let’s see your true core. You sound like the same troll that says nothing but negative things about women here all the time. 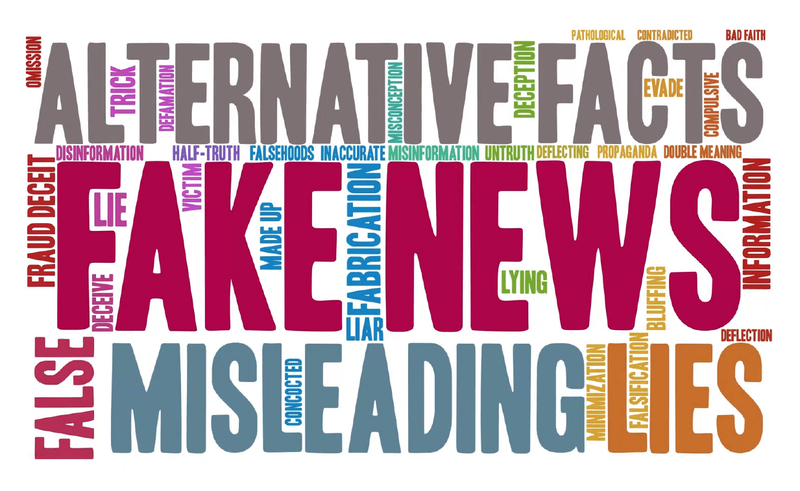 Don’t believe for a second your comment worth its keystrokes. What’s the reason for this march? I plan on watching football. I already got the vote. I already got my own house and money. What else you going to get me when I’m equal already? Maybe you women need real jobs. Maybe you women need to spend more time doing worthwhile and less time doing volunteer feel good stuff. Anti-Trump March… Good on ya! Brava (bravo) to @Char! Your words are like a breath of fresh air in this lineup of insecure women who feel the need to be onstage. THANK YOU!! I’ll be at the march. We women are united in making sure men are in their place. The men should be cleaning the house and wearing the apron. Man go make me a sammich ! I am woman, hear me roar !! I’m Catholic and don’t need a march organized by GenX or millennials not well educated to know that I am equal to any man. I did not accept jobs that didn’t pay me what I’m worth and worked hard to find them. Want some advice? Get some self-esteem. You won’t need to rely on this kind of inadequate public affirmation or civil discourse. We Fought and won the fight. Somebody above said it better….we’ve evolved and stop going backwards and being swayed by people who never studied civics and don’t know our and their history. Your hilarious…your really pulled some excessive posting out of your hat in a short period of time….So so predicable.